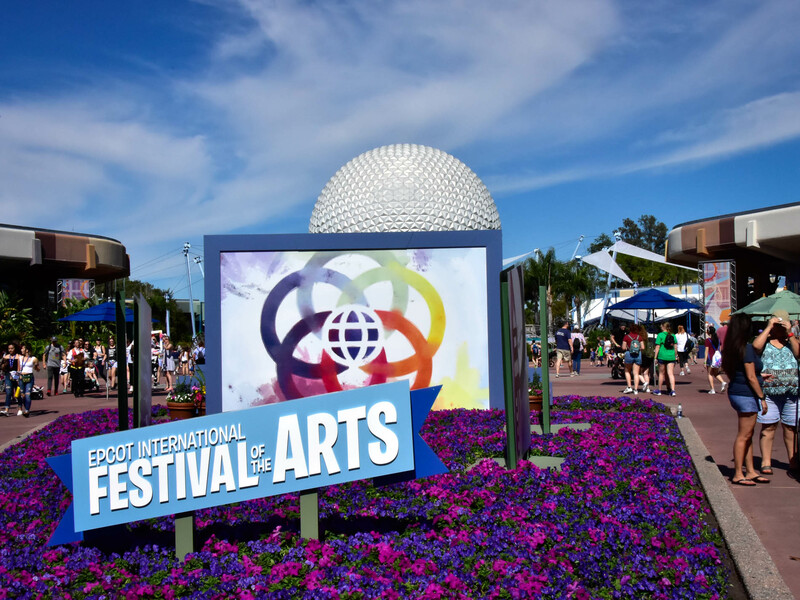 The International Festival of the Arts at Epcot is a relatively new activity for Disney. The first Festival took place in 2017, and has been improving each year. This year the festival runs from January 18 through February 25. 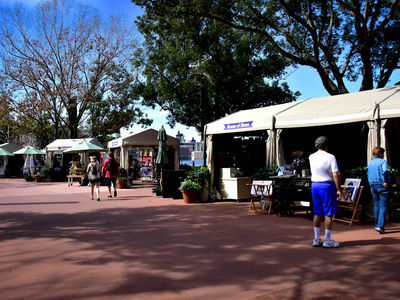 The length of the festivals at Epcot tend to expand as they become more popular and successful, but the Festival of the Arts almost needs to conclude at the end of February in order to give Disney a little time to get ready for the International Flower and Garden Festival, beginning just a few days later on March 6. 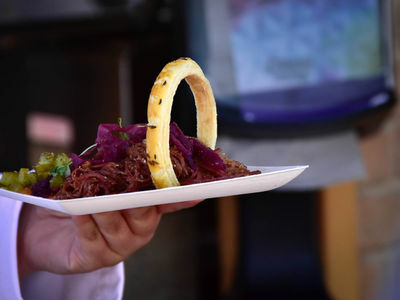 While the Festival of the Arts is about art, there's also the food, and while it's not quite as extensive as the International Food and Wine Festival—which begins in late summer and early fall—it's still worth a look. There are many surprises among the various markets. 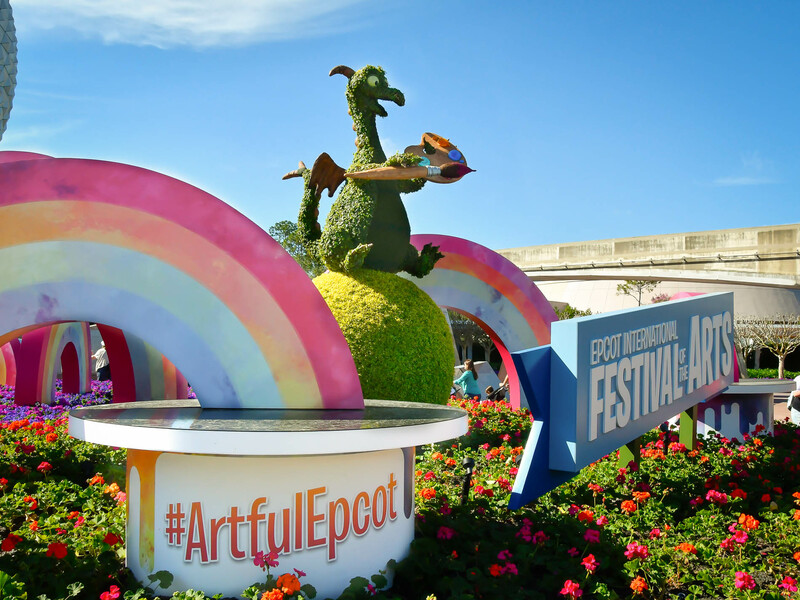 At the entrance to Epcot, you'll find Figment. He's an imaginary dragon that's been featured at the Imagination pavilion since 1982. 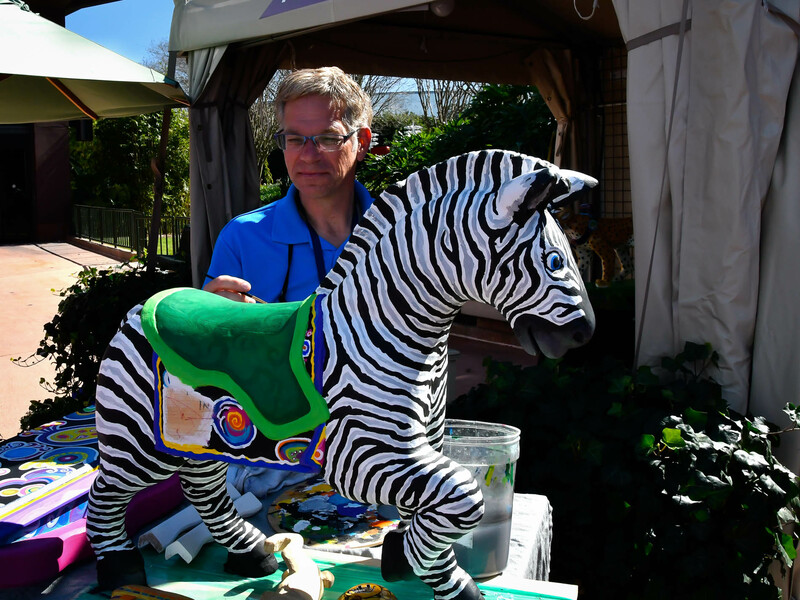 He's especially noted for his imagination and creativity, which seems appropriate for the arts festival. Photo by Donald Fink. 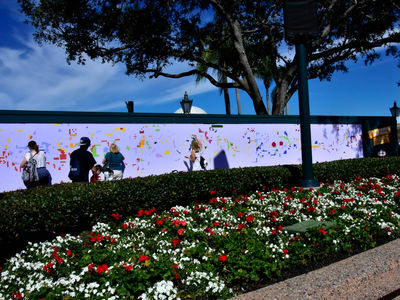 Several spots in Epcot are set up as backdrops for pictures. This one, showing Spaceship Earth with signage showing the Festival is particularly popular. We had to wait in a small line to get an open shot of this scene. Photo by Donald Fink. Here's Figment pointing the way to some of the Festival's chalk art. In this illustration, you can see a more accurate depiction of his true form, with his purple skin, yellow eyes, and steer horns. He's truly a figment of the imagination. 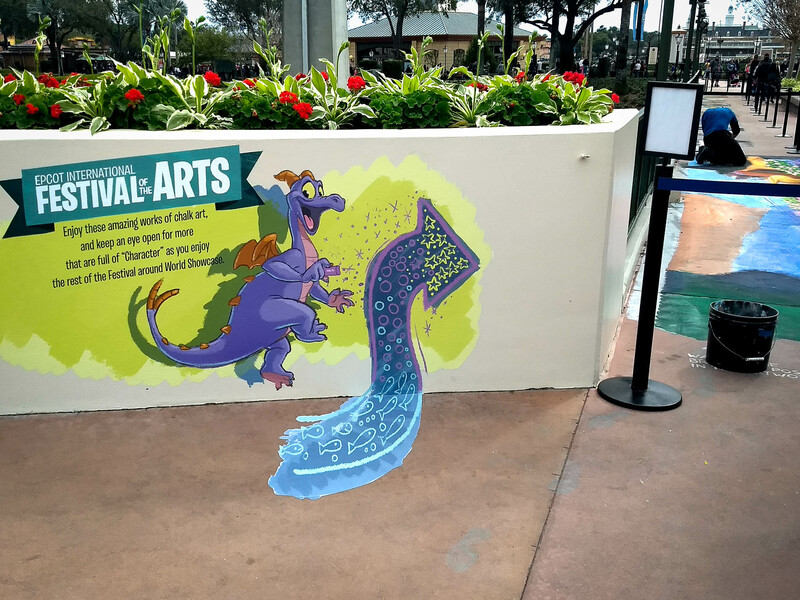 Figment is pointing the way to some of the Festival's chalk art, which is located around the walkways from the Future World East to Showcase Plaza. Photo by Bonnie Fink. Some of the chalk art this year are reproductions of old masters. 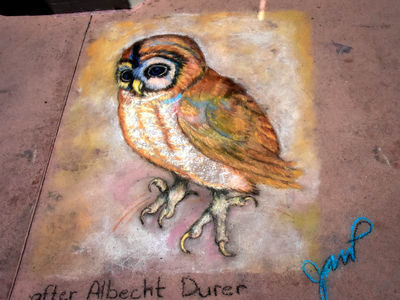 Here is a reproduction of Albecht Dürer's painting, Little Owl. The original was a watercolor painted in 1508, in Nuremberg, Austria. Photo by Bonnie Fink. 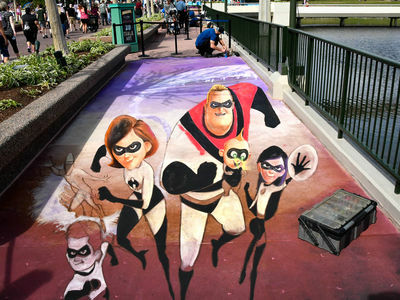 It's not all about the old masters here with the chalk art. 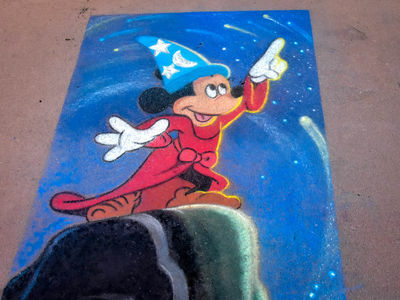 Although, you might argue that Mickey Mouse as the Sorcerer's Apprentice has been around long enough that it should qualify as a "master." Photo by Bonnie Fink. 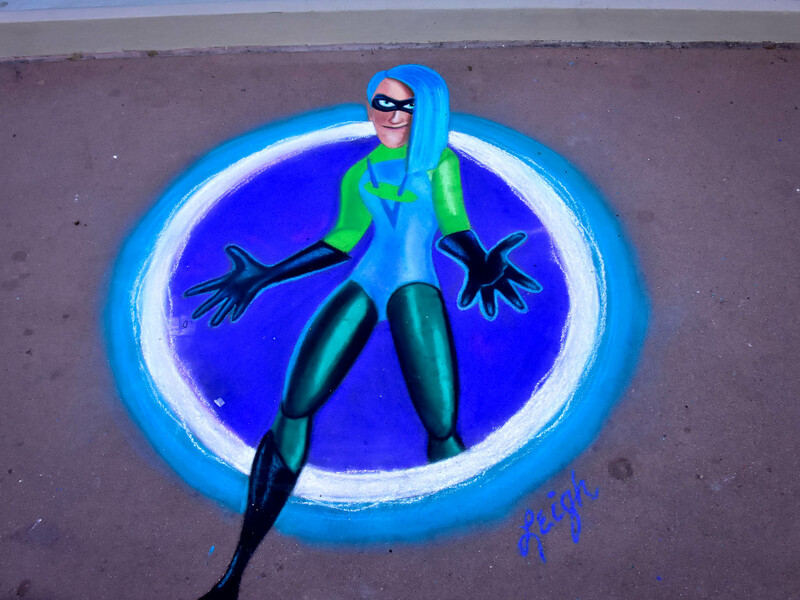 Here is Voyd, from "The Incredibles 2" film, in chalk. Photo by Bonnie Fink. Rapunzel is from Walt Disney Animation Studio's animated film, "Tangled." She also appeared in the sequel, "Tangled Ever After." When finished, this will be a 3D creation by artist Nate Baranowski. Photo by Bonnie Fink. We were thankful to have been able to see the above piece. While it no doubt took many hours in the Florida sun to create, a rainstorm came by the evening after Bonnie made this image and dropped close to two inches of rain on Walt Disney World, no doubt completely washing it away. And that illustrates the nature of chalk art. Nate Baranowski is just one of the many artists who appear at the International Festival of the Arts. Mr. Baranowski is from Tampa but recently moved to Chicago. 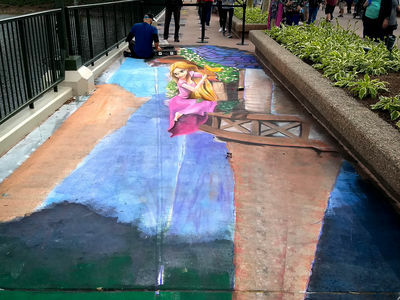 His specialty seems to be chalk art in 2D and 3D, but he also does murals, acrylic, and pastel paintings, and just about anything else you might need. He's here on the weekends and is doing a different painting every week. You can see more of Nate's work on his web site, here. Another chalk art piece from Nate Baranowski is this piece showing Jack-Jack from "The Incredibles 2" using his laser powers. Photo by Bonnie Fink. 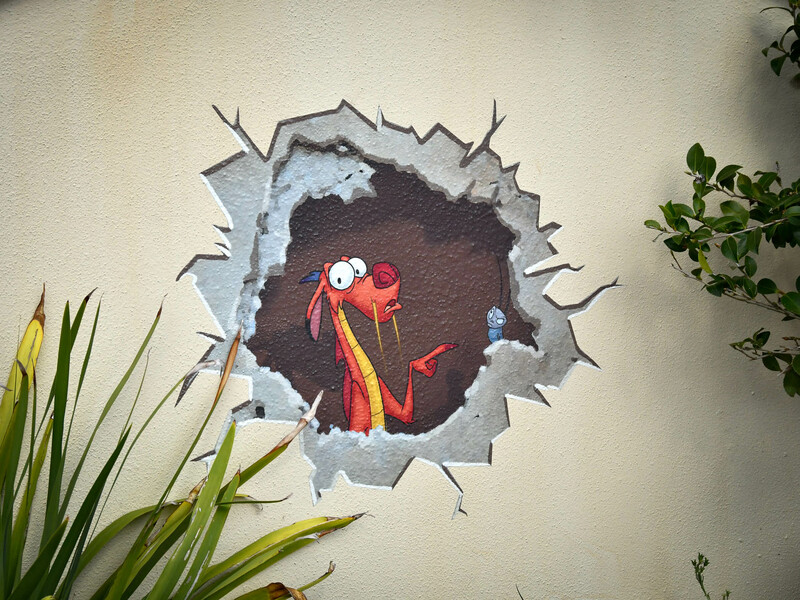 If you look at the walls around World Showcase, you'll find drawings of some of your favorite Disney Characters. 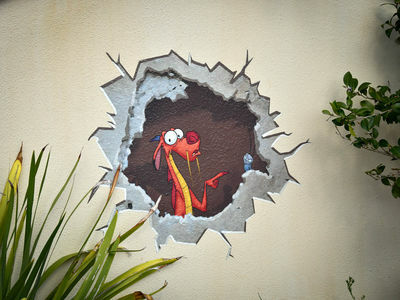 Near China, you can find Mushu and Cri-Kee from the 1998 animated film, "Mulan." You may remember that Mushu was voiced by Eddie Murphy. Cri-Kee, being a cricket, didn't speak. Photo by Donald Fink. 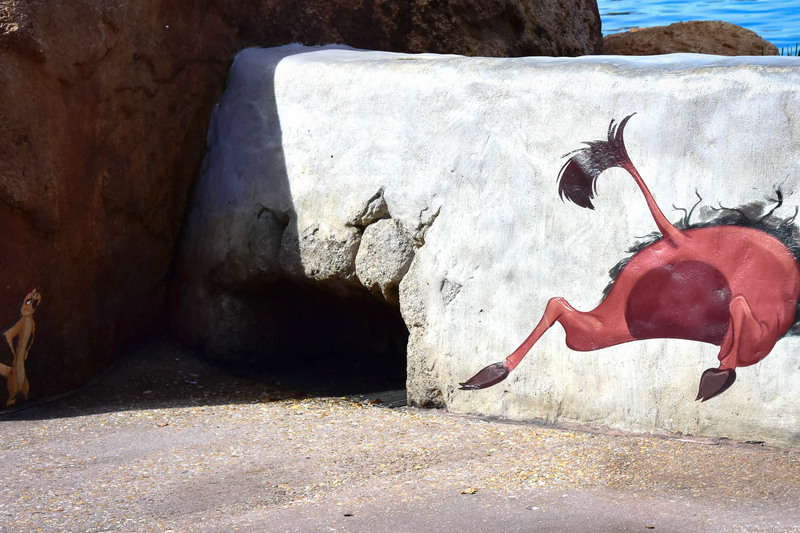 Timon and Pumbaa, from "The Lion King," can be found between the Outpost and Germany. Photo by Bonnie Fink. Dave Librande, from Dave and Beth's Hobby Rockers, is busy working on a hand carved zebra piece. This is his first year at the International Festival of the Arts, and he's been having fun working on his art as he meets with guests who happen by. Photo by Donald Fink. Dave Librande, along with his wife Beth are here at the International Festival of the Arts for the first time this year. They specialize in one-of-a-kind wood carvings, mainly for children. We say these carvings are for "children" with a bit of reservation because they're also really good art. You might argue that they're almost too good to be abused by kids. Of course, the wood work and finish looked substantial to us and no doubt will hold up for many years of inspired and energetic play. Dave mentioned that, while they do whimsical rockers of pretty much any design you may want, they have also done pieces inspired by family pets, or just about anything meaningful. You can see more of their work at Dave & Beth's Hobby rockers. Festival Markets are where the majority of the art is displayed and sold during the Epcot International Festival of the Arts. You'll find most of them around World Showcase. These markets are often staffed by the actual artists, especially on the weekends, and they'll usually sign their art for you while answering any questions you might have. Photo by Bonnie Fink. 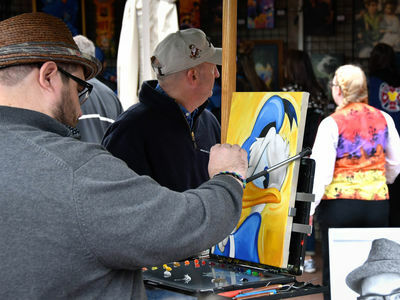 One artist that was present each day we walked by was Tim Rogerson, seen here working on a Donald Duck piece. 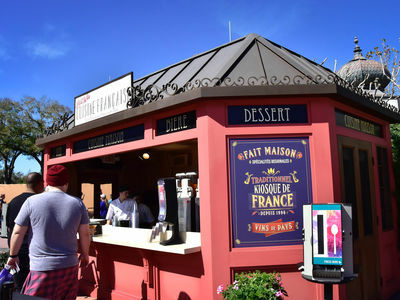 He's located along World Showcase between France and Morocco. While Tim was working on this piece, he was also taking time to talk with guests and sign artwork. Photo by Donald Fink. You can see more of Tim's work here, on his web site. There are several videos showing the creation process of his art. It's worth a look. This image has nothing at all to do with the International Festival of the Arts. 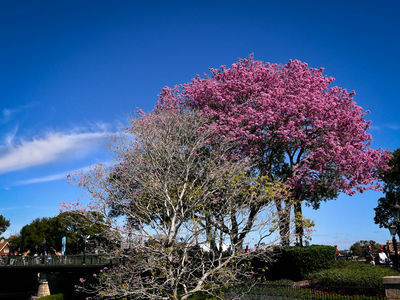 Instead, it demonstrates why we like living in Florida. There aren't many places you can stroll in the midafternoon in February and feel like you're in the middle of spring. 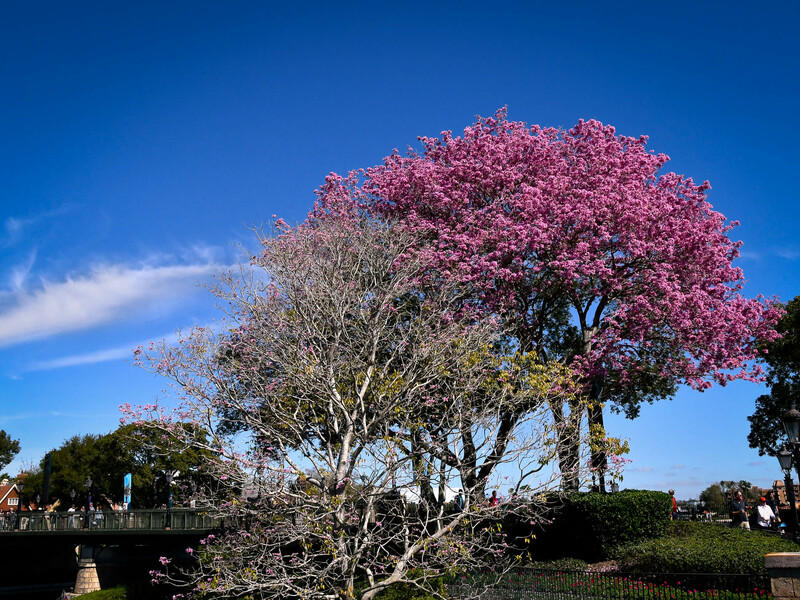 There aren't many seasons here in Florida beyond summer, so when a day comes by that feels like spring, we take it. Photo by Donald Fink. 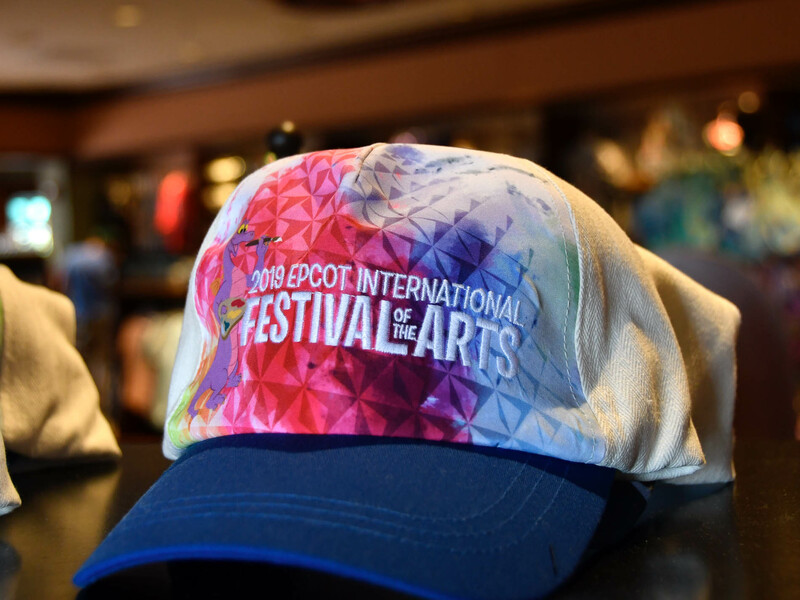 As you might imagine, merchandise related to the International Festival of the Arts is in all the stores this time of year at Epcot. This baseball cap was in the gift shop at the International Gateway, and can be found all around the park. Photo by Donald Fink. 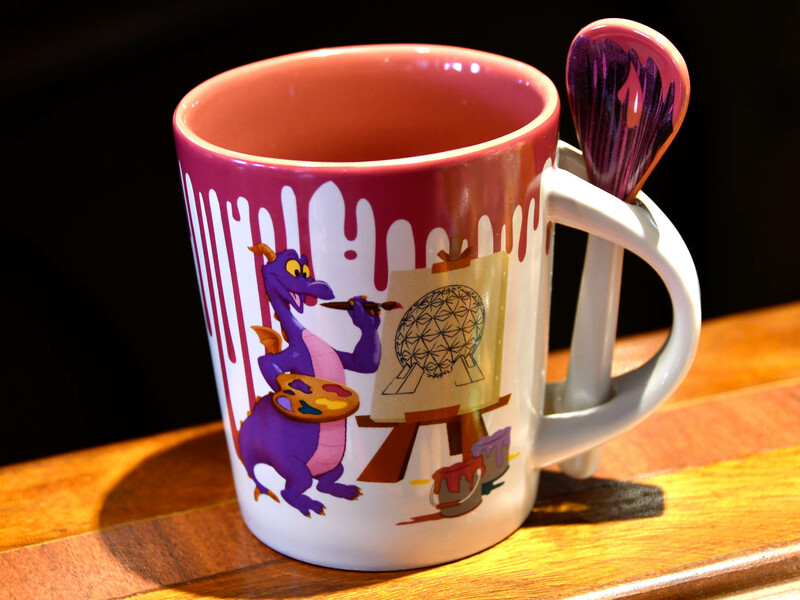 This mug showing Figment working on a painting of Spaceship Earth almost made it home with us. And to be realistic, the festival isn't over. The mug may still find its way into our cupboard. Photo by Donald Fink. The Food Studio in France called L'Art De la Cuisine Francaise is serving up French cuisine and wine. 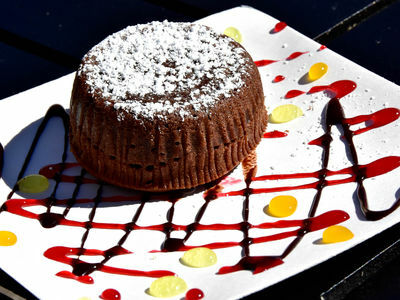 We enjoyed a sampling of the Molten Chocolate Cake, which you'll see below. 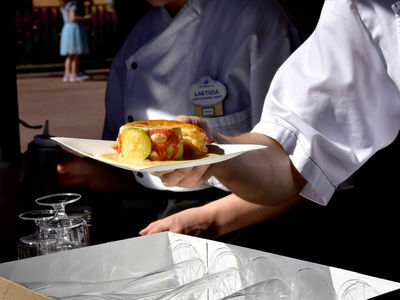 You can also enjoy some savory dishes and several wines from France. Photo by Bonnie Fink. One of our favorite treats at this year's International Festival of the Arts is Chocolate Molten Cake, from L'Art De la Cuisine Francaise in France. 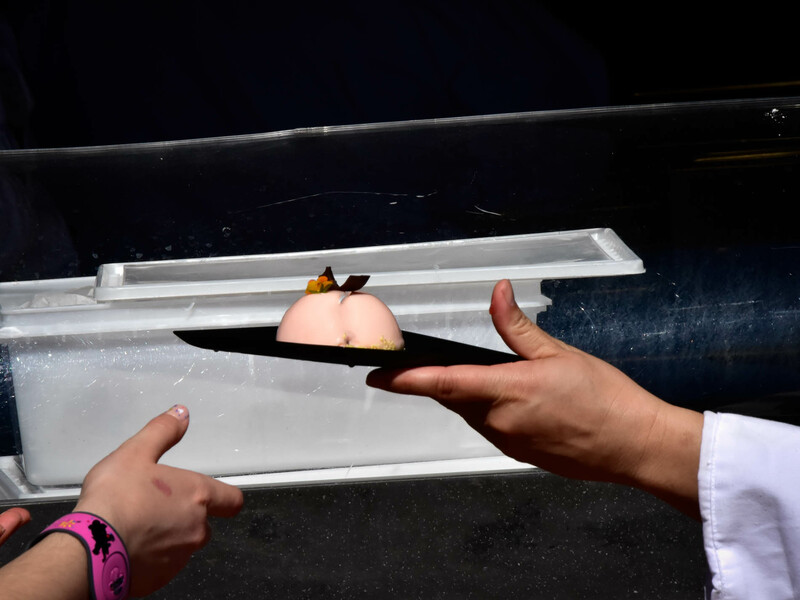 You might notice that the plating on this dish—and all dishes we saw this year—is way better than in the past. It complements the food and makes it look better than the carnival looking plates used in the past. "A" for effort on plating. Oh, and the Molten Chocolate Cake gets an "A" too. Photo by Bonnie Fink. One of the savory dishes offered by L'Art de la Cuisine Francaise in France is the Dariole de Saumon á la Provencale, or Salmon Terrine with Zucchini and Tomato with Beurre Blanc Sauce and Puff Pastry Fleuron. This looks like a nice Burgundy might compliment the dish. Just sayin. Photo by Bonnie Fink. 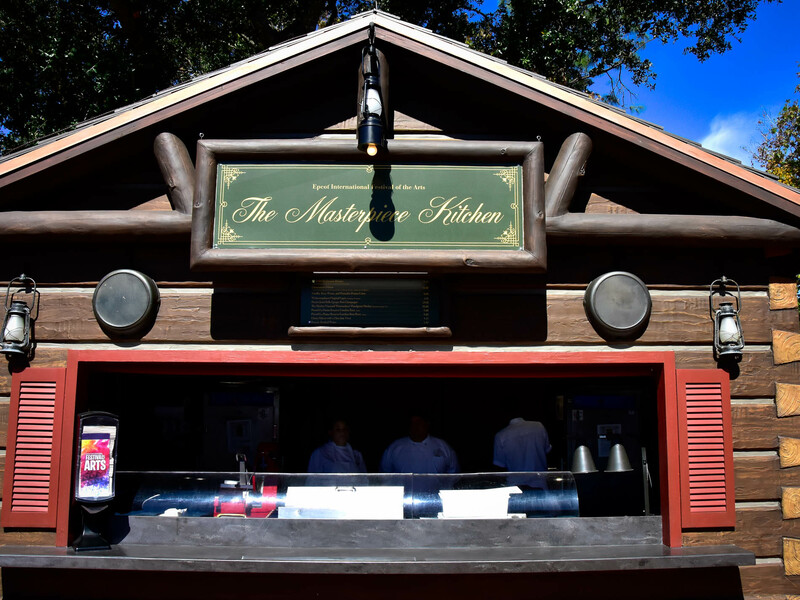 The Masterpiece Kitchen is located at the Canada pavilion along World Showcase. This year they're offering a Wild Mushroom Risotto with Aged Parmesan Cheese that seemed to be a favorite with guests exiting the line. They also offer several wines from Spain and California along with a German beer. Photo by Bonnie Fink. The sweet dish in The Masterpiece Kitchen in Canada is called the Vanilla, Rose Water, and Pistachio Panna Cotta. Photo by Bonnie Fink. If you like your food deconstructed, there's a kitchen for that. The Deconstructed Kitchen is located in Showcase Plaza near the Port of Entry. The Deconstructed Reuben with shredded corned beef, Thousand Island dressing, pickled red cabbage, and a rye curl gets an "A" for plating. Photo by Bonnie Fink. 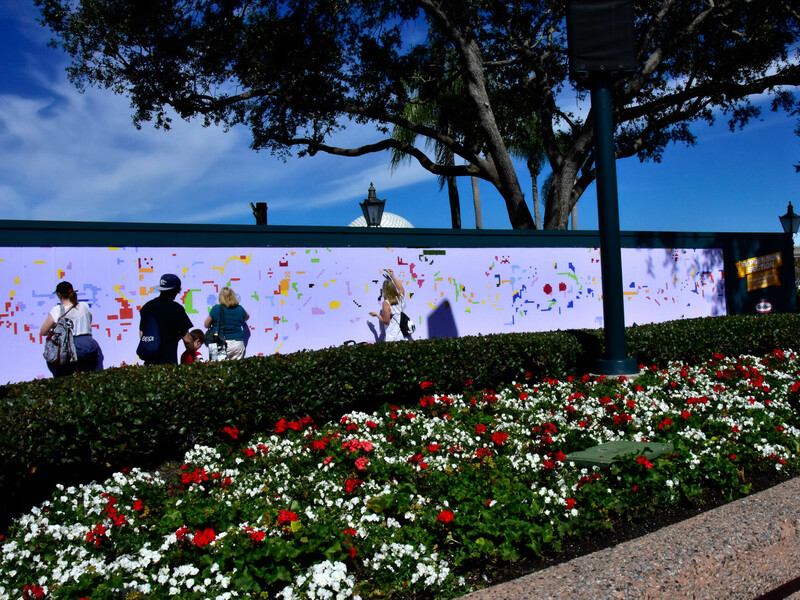 The paint-by-number mural is back this year in its usual spot in Showcase Plaza across from Port of Entry. This mural starts out as a wall of numbered squares. Guests check in with a cast member who hands out a paint brush and a container of paint corresponding to a number. You can then paint in a few squares, but you'll have to come back in a few days to see what you helped to create. 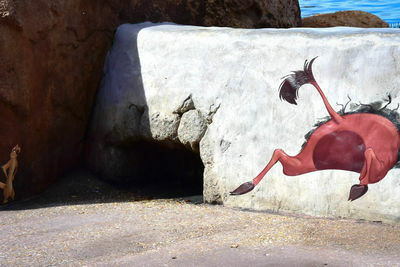 Several murals are created each festival with new ones started as one is complete. Photo by Bonnie Fink. 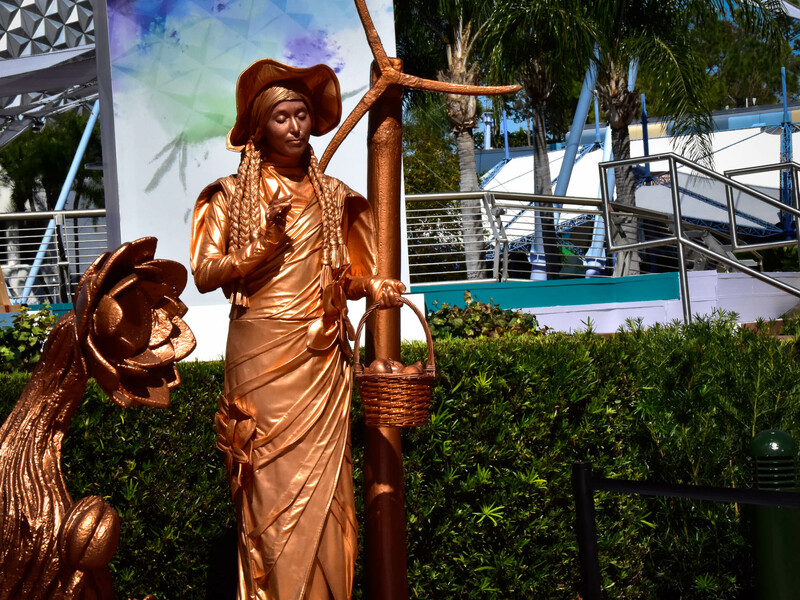 The Living Statues are back and can be found at the Fountain Stage. There's a lot of activity at the Fountain Stage this year, so check a Times Guide if you want to see a particular event. Photo by Bonnie Fink. And finally, there's another photo opportunity on your way out, facing the main entrance. You can shoot a selfie with the colorful sign or turn around and get the iconic Spaceship Earth. Photo by Donald Fink. As we walked through Epcot, we took a moment in between our images to capture some video clips along the way. We think it brings a sense of what this festival has to offer. Have a look. Video by Donald and Bonnie Fink with content from Disney Media. It seems like there's always a festival of some kind at Epcot. In fact, it seems rare when something isn't in progress. 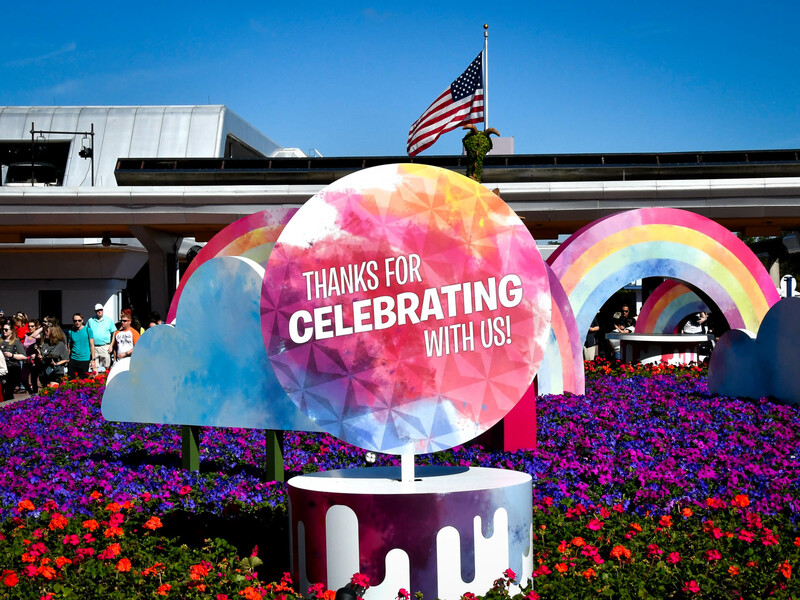 We like the excitement, the variety, and the changes Epcot makes throughout the year. For us, Epcot never gets old.